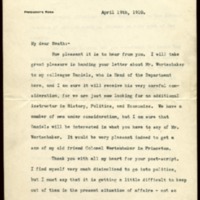 Open appointment at Princeton University; Woodrow Wilson denies interest in politics at present time. How pleasant it is to hear from you. I will take great pleasure in handing your letter about Mr. Wertenbaker to my colleague Daniels, who is Head of the Department here, and I am sure it will receive his very careful consideration, for we are just now looking for an additional instructor in History, Politics, and Economics. We have a number of men under consideration, but I am sure that Daniels will be interested in what you have to say of Mr. Wertenbaker. It would be very pleasant indeed to get a son of my old friend Colonel Wertenbaker in Princeton. Thank you with all my heart for your post-script. I find myself very much disinclined to go into politics, but I must say that it is getting a little difficult to keep out of them in the present situation of affairs - not so much the present situation in the University as the present movement of opinion among my friends in this part of the country. How I wish I could see you sometimes and renew the old days. Whenever I am with you I feel like a boy again. It is easy to throw off all the perplexities and annoyances of the official duty. We are having a merry fight here, but it ought, if we keep our heads, to come out right. Wilson, Woodrow, 1856-1924, “Woodrow Wilson to Richard Heath Dabney,” 1910 April 19, WWP20453, University of Virginia Woodrow Wilson Letters, Woodrow Wilson Presidential Library & Museum, Staunton, Virginia.